Editors note: In August, residents in Huron Township will vote on a millage renewal for the operation of the police department. The renewal will not increase taxes on homeowners — they will continue to pay the same amount that they are currently paying on their tax bill. In a letter to the community, Huron Public Safety Director Everette Robbins explains why the millage is critical to the stability of the police department, and that it is needed to continue to provide the current level of police services in the township. He also gives updates on the status of the department of public safety, including several things the department has accomplished during his tenure as director. Today marks my four-year anniversary as your Chief of Police. Four years ago, the residents of Huron welcomed me with open arms and since then, it has been my mission to ensure that we provide our citizens with exceptional police and fire services. I first must thank the Supervisor and the Board of Trustees for their unwavering support of public safety over the past four years. I must also thank my hard working, professional, and dedicated command staff who stands by my side every step of the way. Over the past four years, we have seen some remarkable changes and accomplishments within the public safety departments. Most importantly, we have made some great strides in building a strong relationship within our community and hope to see our community partnerships continue to grow. Relationship building is one of our most important fundamental principles and is something that we can all participate in to eliminate the negativity and deficiencies that impacts all of us. Initiatives such as the Citizen Police Academy and Shop with a Hero are great examples of things that we can accomplish when we all work together. The Huron Township Department of Public Safety embraces a community-based, problem-oriented, data-driven policing strategy that emphasizes the use of problem-solving and community policing techniques and a reliance on data to identify threats, measure the results of our interventions, and to hold ourselves accountable; to each other and to our community. In the last four years, with some help from our community partners, we have created new units such as our Neighborhood Coordinators, Mounted Patrol (Sponsored by Chapps), Detective Bureau, Bicycle Patrol (Sponsored by Applefest Committee), Explorers (Sponsored by the Huron Rotary Club), Honor Guard, Problem-Oriented Policing, Community Policing, Computer Forensics, Motor Carrier and Evidence Technician. We are represented on the FBI’s Crime Against Children Task Force, a nationwide task force that saves children who have become the victims of Human Trafficking. We continue to have one of the areas most respected and prominent Reserve Police Officer Units made up of community volunteers. We have a K9 Unit that is working to get illegal narcotics out of our community. Our four legged and most popular “Chief”, who was named by our school children, has quickly become a valued member of our department and community. We have reinstated our School Resource Officer in the Huron School District, while continuing to provide the same service at Summit Academy Schools. Since 2014, we have equipped our officers with equipment such as bullet-proof vests and patrol rifles. We have made good on our promise of transparency through the use of officer worn body cameras. In-car computers have kept our officers in the community rather than in the station writing reports. We have a 24-hour Emergency Dispatch Operations Center that is second to none. An experienced, well-trained dispatcher is able to gather a lot of high quality, vitally important information that can help first responders form an early understanding of what they will be facing upon arrival at the emergency scene. Our dispatchers are the unsung heroes. They are the glue that holds our Public Safety Department together and each help assure that our first responders go home safely to their family each and every night. Community Policing Officer Phil Czernik presents a basketball to a young resident in Huron Township. Photo courtesy of the Huron Township Police Department. The thing that I have been the most impressed with in these past four years is the incredible work ethic and dedication displayed by the men and women who put on the Huron Township Public Safety uniform. Police officers and Firefighters put their lives on the line every day to keep us, our families and our community safe. They put themselves directly into situations most of us would run away from and see things daily that most people would rather not think about. 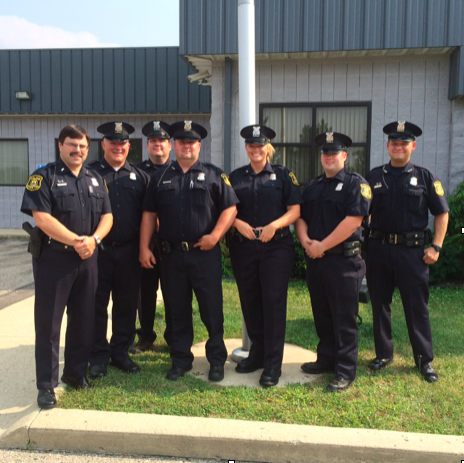 Pictured from left to right: Reserve Commander Jim Dufour; Reserve Police Officer Erik Eastridge; Reserve Police Officer Justin Hill; Reserve Police Officer Aaron Wilmoth; Reserve Police Officer Meredith Foster; Reserve Police Officer James Stocking; Reserve Police Officer Clint Smith. In July of 2016, I was appointed to be the Director of Public Safety, which gave me the opportunity to lead our top-notch Fire Department. I cannot express in words the admiration that I have for the work our firefighters do. Watching our firefighters, under the great leadership of Chief Jamie Hinojosa, run into burning buildings while everyone else is running out is something they never get enough credit for. My family and I sleep comfortably at night knowing that if we need them, they will always be there. 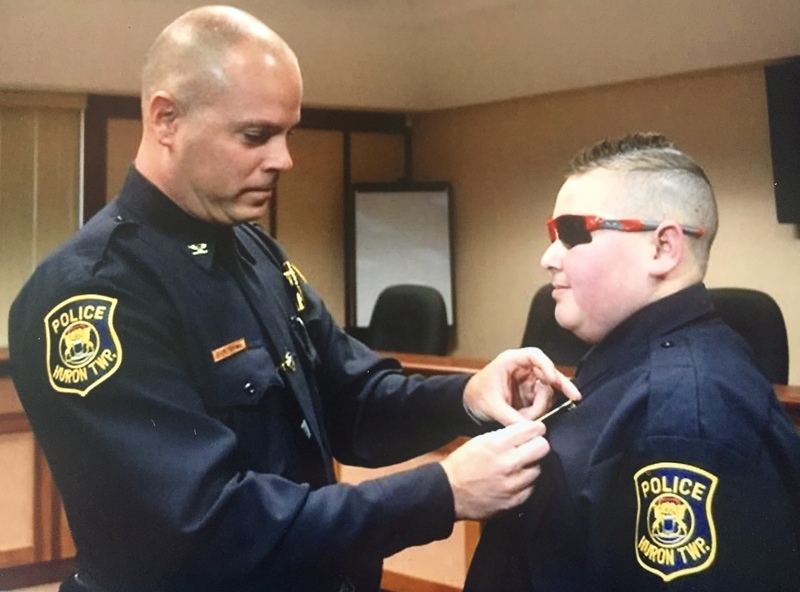 Alec Antonian, cancer patient and honorary officer, with Chief Robbins. On August 7th, 2018, we will be asking the voters for a millage RENEWAL. The community’s support for this millage is critical to the stability of our police department and is needed to continue to provide the level of protection our citizens deserve. In renewing this millage, homeowners will continue to pay the exact same amount in property taxes as in the previous years. There will be NO increase in taxes paid. I am seeking volunteers to participate on a citizen committee to assist with this millage renewal. If you are interested, please email me at erobbins@hurontwppd.us. I am hoping that we can all come together for the safety of our community. I want you to know that I realize that there is still much work to do and that we must keep working daily with our community stakeholders, each of you, every hour of every day. Once again, it has been an honor and a privilege to serve this great community that my family and I call home. As always, my door is always open. I look forward to what we can accomplish together in the next four years. This entry was posted in Front Page News, Government, Police & Fire on June 1, 2018 by Scott Bolthouse.